AFTER PIPELINES, CASTRO, "CASH FOR ACCESS,"
Our latest nationwide public opinion survey explored a wide variety of topics. Our first release describes at the current state of federal politics, including reactions to a variety of events and decisions. Liberal Party support has seen some softening in recent weeks, but remains at levels roughly equal to the result on election day just over a year ago. 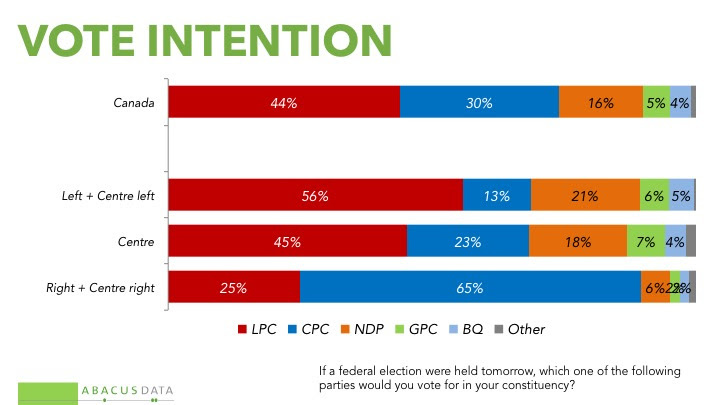 The number of people who would consider voting Liberal today is 59%, off the highs of late summer, but still substantially ahead of their political rivals (NDP at 47%, CPC at 46%). 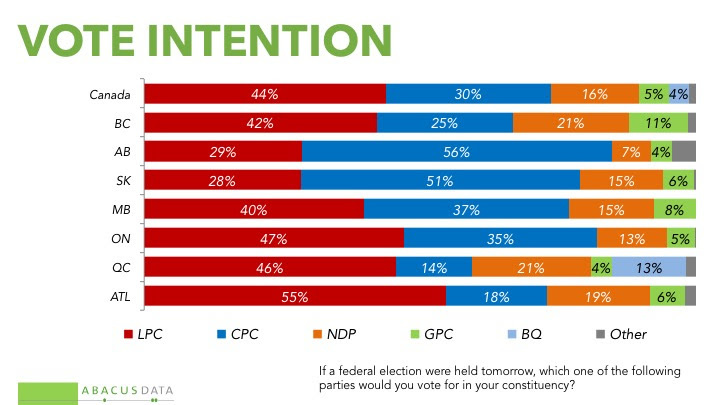 Current voting intentions show 44% would vote Liberal, 30% CPC, and 16% NDP, reflecting a 5-point increase in CPC support from November. 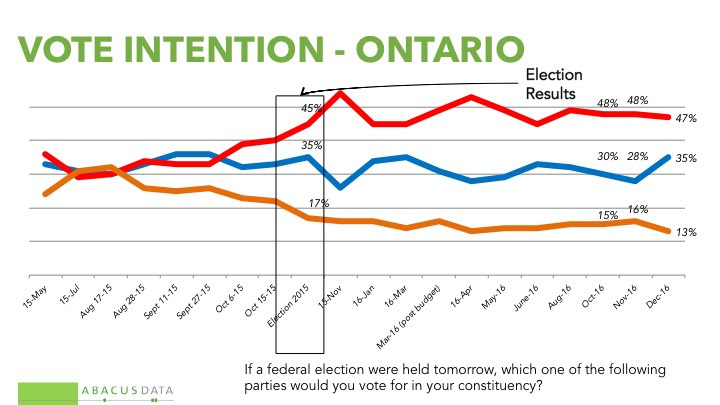 Compared to last election day, the Liberals are up 4 points, the Conservatives down 2, and the NDP down 4. In the provinces with the largest number of seats, the Liberals continue to lead by substantial, but not as robust margins, compared to November. In Ontario, the Liberals would win the support of 47%, the Conservatives 35% and the NDP just 13%. 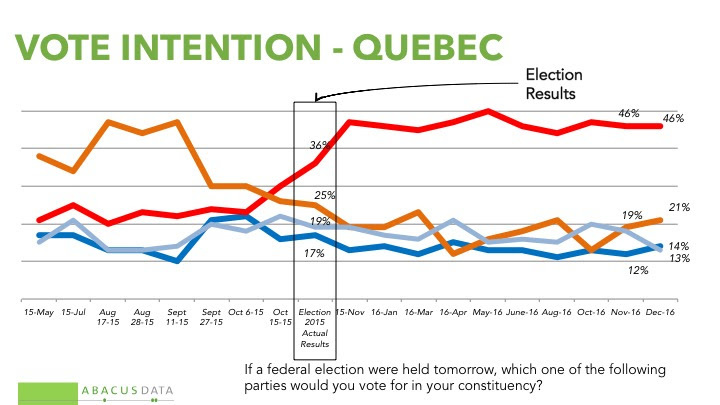 In Quebec, the Liberals find support from 46%, the NDP 21%, and the Conservatives 14%, with the BQ at 13%. In BC, Liberal support is at 42%, down from the 46% we measured in November, while Conservative support is up from 21% to 25%, and the NDP is at 21%, essentially unchanged from November, but off the lows measured in the summer. Compared to the Election Day result last year, the Liberals are in a roughly equivalent place in Ontario and BC, and considerably stronger in Quebec. 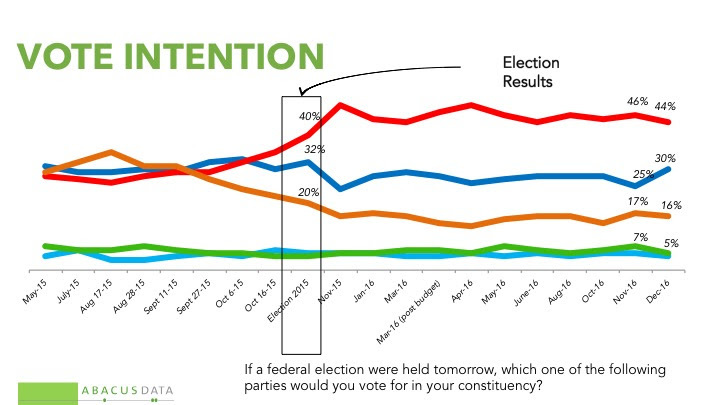 In Alberta, the Liberals (29%) trail the Conservatives (56%), with the NDP at 7%, this is unchanged from our last wave. In Saskatchewan, the Conservatives have 51% followed by the Liberals at 28% and the NDP at 15%. In Manitoba, the Liberals (40%) and the Conservatives (37%) are neck and neck. Across Atlantic Canada, the Liberals have 55% support, well ahead of the NDP at 19% and the Conservatives at 18%, again unchanged from November. The Liberals advantage continues to be based on dominating the NDP (56% to 21%) among self described “left of centre” voters and being more than 20 points ahead of both other parties among voters who say they are on the centre of the spectrum. The Conservatives enjoy a dominant two thirds support among those who consider themselves to be “right of centre” with the Liberals winning 25% of right of centre voters. For all 8 items tested half or more said they either that they hadn’t heard of these topics or that they had no impact on their views of the government. Fundraising by the Liberal Party and the PM has been a topic of considerable coverage and political skirmishing in recent weeks. 31% say they haven’t heard about this, and another 32% say it has had no impact on their views, 27% said it made them feel worse about the Trudeau government, 9% better. The Prime Minister’s reaction to the death of Fidel Castro had an impact on about half of Canadians, by a margin of 2:1 people seemed disappointed in his reaction. The government substantially positive reviews for the decision to put Viola Desmond on a banknote: 37% said it made them feel better about the government, 6% worse. 3 out of 4 people had no awareness of or reaction to the government’s reaction to the Electoral Reform committee report and the mydemocracy.ca online consultation. While the online consultation attracted some criticism, the impact on public opinion was fairly muted: 14% said the mydemocracy.ca initiative made them feel better about the government, 14% worse. The government reaction to the committee report produced more negative reactions, suggesting disappointment in the tone and substance, but still only 18% said this choice made them feel worse about the government. All three pipeline decisions were slight net positives, in terms of the public reaction, on a national basis. 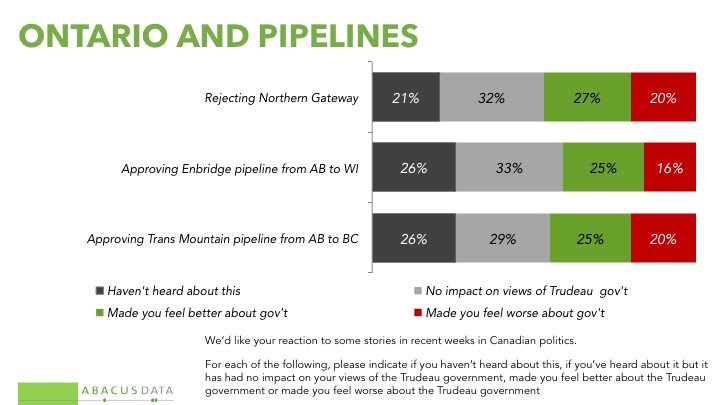 In the case of the rejection of Northern Gateway, 25% said it made them feel better about the Trudeau government, 20% worse. For the Kinder Morgan and Enbridge Line 3 approvals, 25% said these project approvals made them feel better, 18% worse about the government. 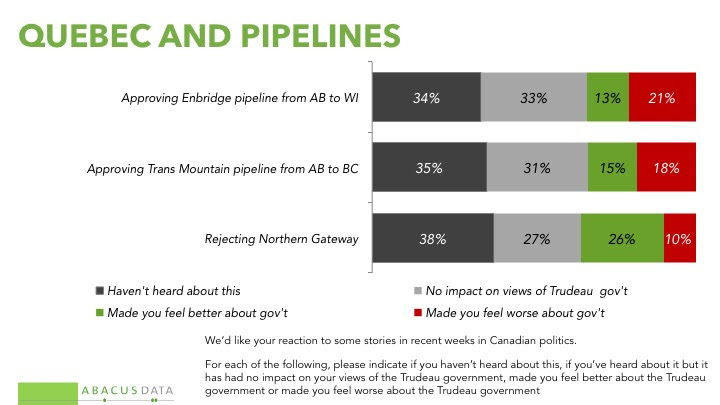 In BRITISH COLUMBIA, 39% said the approval of Trans Mountain made them feel worse about the Trudeau government compared to 25% who said it made them feel better. 36% either didn’t hear about the decision or said it made no impact. 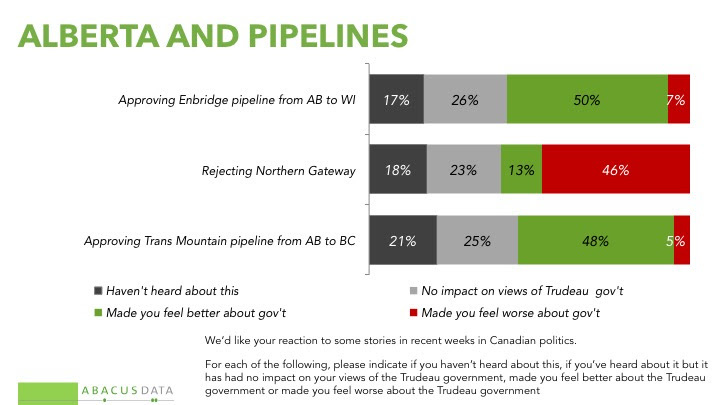 Rejection of the Northern Gateway pipeline created an opposite reaction, with 37% saying it improved their view of the government while 21% said it made them feel worse about it. 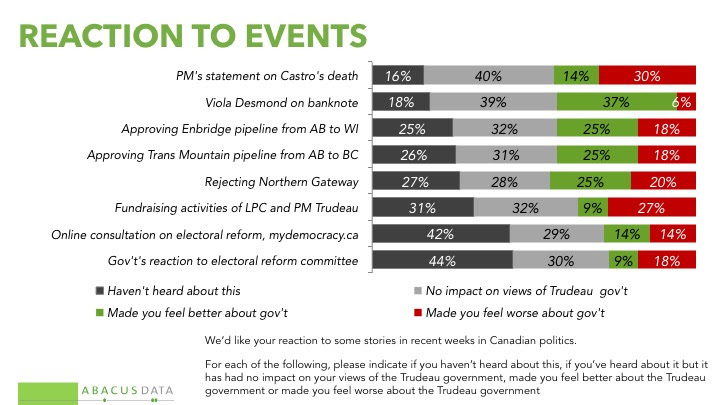 In ALBERTA, half said the government’s decision to approve the Line 3 and Trans Mountain made them feel better about the Trudeau government while only 5% and 7% said it made them feel worse. 46% said the rejection of Northern Gateway made them feel worse compared with 13% who said it made them feel better. In QUEBEC, where support for pipelines generally has been lower than in other parts of the country, two thirds said they hadn’t heard of the government’s decisions or said the decisions had no impact on their view of the government. One in four Quebecers said the decision to reject Northern Gateway made them feel better while 10% said it made them feel worse about the Trudeau government. Among 2015 Liberal voters, 16% said the decision to approve Trans Mountain made them feel worse about the government while 27% said it made them feel better. The majority hadn’t heard of the decision or said it made no difference. Among Conservative voters, 41% said the decision made them feel better about the government while 11% said it made them feel worse. Among NDP voters 35% said the Trans Mountain approval made them feel worse while 20% said it made them feel better about the Trudeau government. On the Northern Gateway decision, the pattern is reversed. NDP voters were more likely to say the decision made them feel better than worse (37% better vs. 10% worse) while Conservative voters were more likely to react negatively (48% worse vs. 12% better). 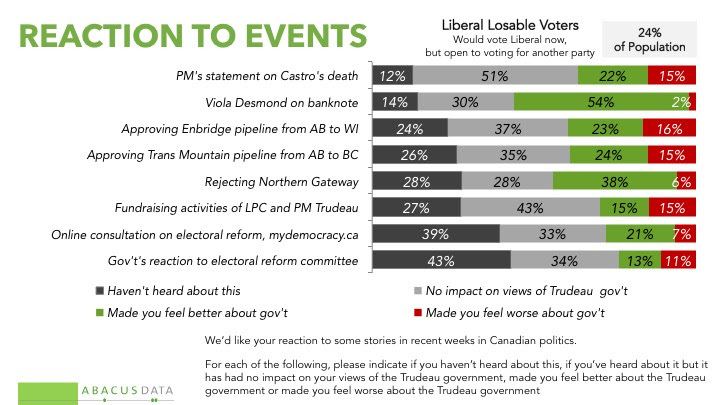 Liberal voters reacted favourably with 35% saying they feel better about the government after its Northern Gateway decision while 9% feel worse about the government. On 6 of the 8 items tested the majority were not affected in terms of any change in feeling towards the government. Only the banknote decision and the rejection of Northern Gateway had an impact on more than half of this voter group, and decidedly positive in both cases. Between 6% and 15% of these Liberal voters feel worse about the government based on a variety of these events, but in each case, equal or larger numbers said the item made them feel better about the government. The two biggest net positives for the government with these voters were the Northern Gateway decision and the Viola Desmond choice. Both pipelines that were approved had a positive impact on about a quarter and a negative impact on 15%-16%. Most of the events had little affect thus far on feelings about the federal government. Putting Viola Desmond on a banknote had the greatest potential pull for the Liberals. Rejecting Northern Gateway also had a net positive effect. The pipeline approvals had a mixed effect. Electoral reform matters had little effect. The fundraising questions had the largest net negative impact, with 21% saying it made them feel worse about the government and 7% better. “The choices the government has been making on energy and climate policy are probably the most politically challenging ones they face, in terms of trying to sustain support among a broad coalition of voters across the spectrum. So far, the combination of decisions on carbon pricing, pipelines, and shifting energy use, is landing relatively well. Some are disappointed with a pipe that’s approved, others with a pipe that’s rejected. Some think the carbon price is too low or too slow, while others feel the opposite way. However, in terms of the overall impact on the support levels for the government, making choices on these controversial issues probably could have gone a lot worse. Of course, it’s fair to observe that the debate on the Trans Mountain pipeline is far from over – and the full impact will only be known over time. Of the other issues and events we looked at, the debate about Liberal fundraising practices is the one that looks as though it could have some corrosive effect on Liberal support – but the impact so far has been pretty modest. “As the year comes to an end, the political environment in Canada looks much like it did at the start of the year. The Liberals hold commanding leads in Canada’s three largest provinces and have more support than on Election Day in October 2015. In the past month, the Trudeau government has made some difficult decisions about pipelines, faced scrutiny over its fundraising practices, and criticism for its handling of its electoral reform pledge. The pipeline decisions seem to have been accepted by most Canadians as a reasonable balance. 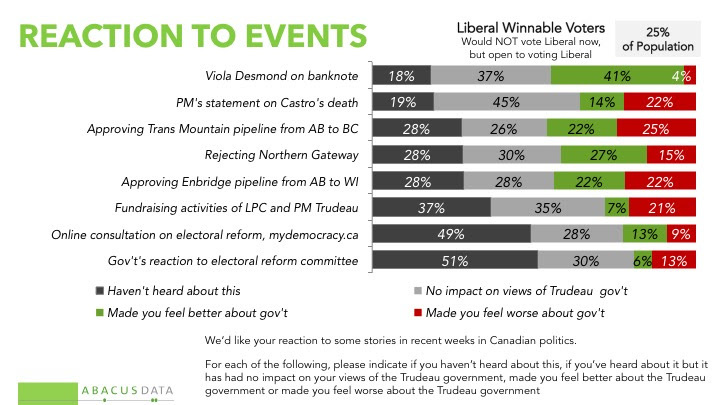 Even in BC, where 39% say the decision to approve Trans Mountain made them feel worse about the government, Liberal support is unchanged, and still above what the party received in the last election. 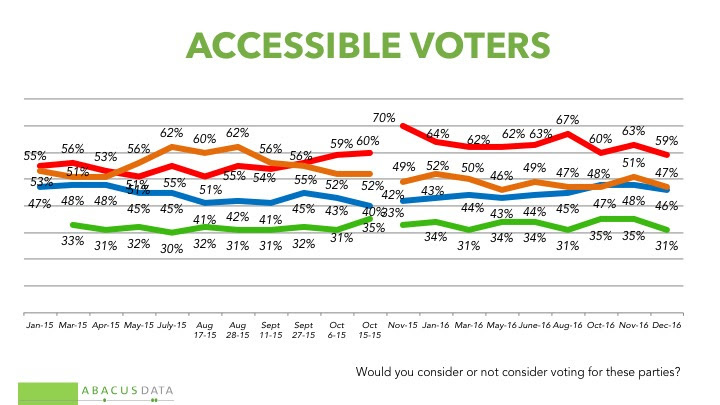 We have seen a decline in the pool of accessible voters for the Liberals, but we’ve seen a similar decline for three of the four major parties. In November 2015, 70% of Canadians said they would consider voting Liberal. 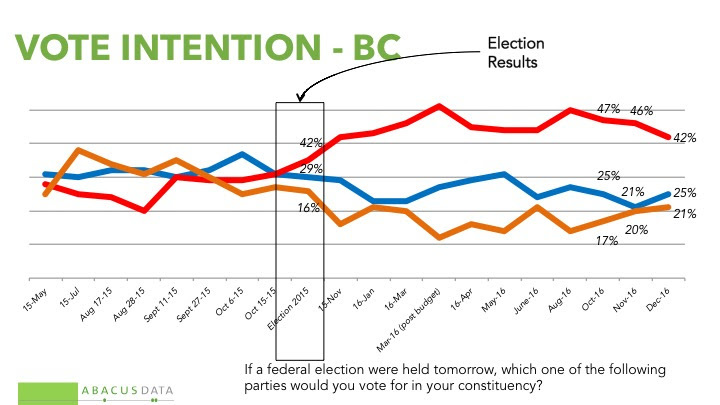 Today, it’s down to 59%, the same level we found in the final weeks of the federal election campaign. Governing for a year has shrunk the tent a bit, but the Liberals remain in a far better place than any of their rivals. Our survey was conducted online with 1,848 Canadians aged 18 and over from December 12 to 14, 2016. A random sample of panelists was invited to complete the survey from a large representative panel of over 500,000 Canadians. The Marketing Research and Intelligence Association policy limits statements about margins of sampling error for most online surveys. The margin of error for a comparable probability-based random sample of 1,848 is +/- 2.3%, 19 times out of 20. Copyright © 2016 Abacus Data, All rights reserved. We send notices about new polls we release.